I want to be like you when I grow up…. 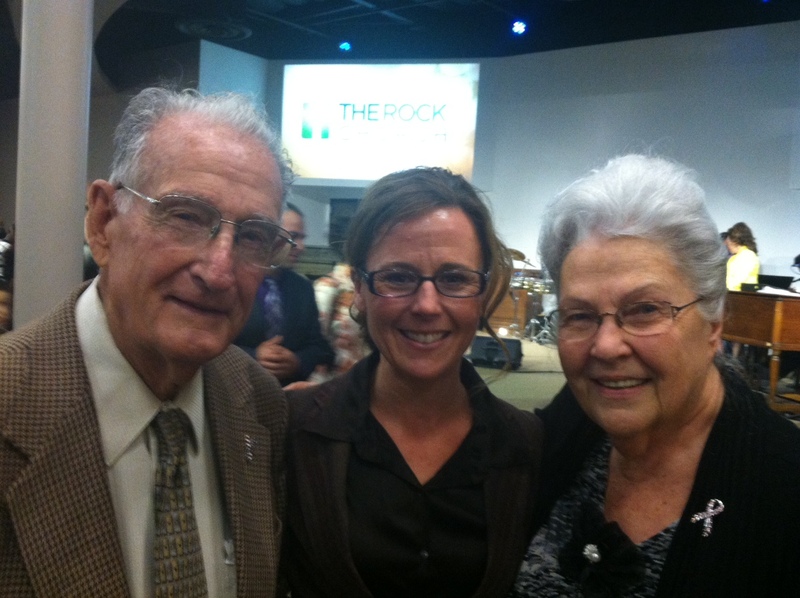 This past weekend I was privileged to meet an extraordinary couple who attend The Rock Church in Sunnyvale, California. They are proof that age is just a number and that wellbeing can be achieved no matter your date of birth. I did not get their first names so I’ll refer to them as the people there refer to them…..Momma and Papa Leaman. He is a spry 90-year old gentleman and she is an energetic 85-year old lady. There are several choices they make that enable them to live such full lives. 1. They recognize the importance of moving their bodies. They attend their local health club three mornings a week and walk for 45 minutes and participate in an aqua fitness class. Because of the ladies conference this past weekend, they were not able participate in their typical Friday morning fitness routine, and Papa Leaman was disappointed that they had to miss. 2. They are active members in their church. They attend services and special events that their local church sponsors. They help when they can and where they can – they know that they are a part of a community and you can see how the other members of the congregation interact with them and let them know that they are loved, honored, and appreciated. I was there this past February for a dinner at the church and they were both in the kitchen helping out….and Momma Leaman is quite the chef. She helps with the food when she is able. 3. They are madly in love with each other. They have been married 66 years and she refers to him as her “latin lover” 🙂 (He is Italian and Spanish.) Upon meeting him, he will proudly pull out a picture from his wallet to show you–it’s a little worn and faded but the beauty of the young lady is breathtaking. It is one of the first pictures she gave to her sweetheart. As I watched them talking to other members of the congregation, I saw that they still like to hold hands. 4. Travel and adventure is still vital in their lives – they don’t leave that for the young people. The last few years they’ve went with family members to Hawaii for one month to vacation. Then last year, they decided to take a cruise all by themselves without any family members. They refuse to let fear of the unknown keep them in their comfort zones. 6. They refuse to allow health issues to run their lives and they make whatever changes they need to in order to keep disease from diminishing their quality of life. When he was diagnosed with diabetes, they went to informative sessions for two weeks to learn everything they could do to help the symptoms from escalating. They made lifestyle changes and it’s working….he is only has to take one pill a day. She was diagnosed with breast cancer and she did her research and made her choices and is cancer free. At age 85, she is only on two prescription meds per day. This couple radiates warmth, love, and well-being. I wish all of you could meet them because I know they would inspire you as much as they inspired me! Momma and Papa Leaman, I want to be like you when I grow up! As a group exercise instructor, it is my mission to give each class participant motivation, encouragement, a challenge, and a fun time during class so when he/she walks out of my class, he/she feels better, stronger, more energetic, and glad that he/she made the effort to attend my class. Last Wednesday morning in Zumba at Northside YMCA, I had a new class participant and she had never tried a Zumba class before. I made sure to chat with her after class and encourage her to come back. She proceeded to tell me that it’s the first class she has been back to after losing her mother unexpectedly at the end of June. I could tell she wanted to talk, so for 20 minutes I listened….shared a little bit of my story of losing my grandmother a few weeks ago…and shared how being physically active can help us through dark, emotional moments. We both shed a few tears and then she gave me a hug and a little kiss on the cheek and thanked me for listening and said she would be back. In this same class I have a senior lady who attends….I figured she was in her late 60s…she has been attending for a few weeks now…always smiles…has a great time….and makes sure to thank me after class. I was moved to tears when another participant shared me the story of this lady, Phyllis. Phyllis is 79 and is the caregiver for her husband who has Alzheimer’s. She hires a sitter once a week so she can attend my class. I was overwhelmed with emotions after hearing the stories of these two ladies. That is why it is vital for me as an instructor to give 110% in every class…no matter how I feel or no matter the day that I am having. It is not about me….it is about my class participants. Health and wellness is more than just physical fitness….it is emotional wellness…..it is mental wellbeing….it is experiencing moments of joy, happiness, and fulfillment. I want my class participants to leave my class feeling like a better person…a stronger person…a healthier person….and feeling empowered, encouraged, and motivated to face the rest of their day no matter what may come their way. More lessons I’m learning from the classroom…. I am one of the millions who has been staying up way too late to watch the world’s top athletes compete in the London 2012 Summer Olympics. As I’ve watched, I have learned some valuable lessons that I hope to apply in my own life. As I watched 16-year-old Gabby Douglas go through her gymnastics routines, I could not help but be drawn in by her engaging smile and her fun attitude. She had me smiling as I watched her have fun while performing her floor work. Yes, she knew she was at the Olympics; and, yes, she knew she was performing for the chance to win a medal. However, for Gabby, it appears as if it was just another performance doing something she loves and enjoys doing. Her smile lit up her face the entire time…she was having the time of her life. I learned from her that if you do what you love and do it with passion while having fun, you will win the gold. While watching the interview with Carmelita Jeter, it was mind-boggling to hear how people have slammed her, made negative remarks about her, posted things on the internet about her and questioned her authenticity in her performances. What intrigued me and taught me a valuable lesson was the statement she made towards the end of her interview: You can let what people say consume you or fuel you. Wow! If it consumes you, it drains you and is negative. If it consumes you, it energizes you and fuels you to personal best records on the track. And how can I fail to mention Oscar Pistorius, the first double amputee sprinter to compete in the 400 meter run in the Olympics????? Can we say “NO EXCUSES” to go for your dreams??? He has had to fight adversity and naysayers – people who said, “he has an unfair advantage because of his blades….they give him an edge…” What???? Someone with legs and feet is at a disadvantage over someone who has had both legs amputated below the knees? I’m sure he is another person who doesn’t let what people say consume him. I’ve learned from him that no matter how difficult it may seem to achieve your dream, you still have to believe in your dream, hope in it, and go for it. The human body is an amazing design. We all have an athlete that lives inside us that wants to be challenged. It’s never too late to go for the gold in our lives….it’s never too late to train to live our dream. No matter what anyone says…no matter what anyone thinks….. Do what you love and love what you do. Live every moment with passion and no regrets. Just do it! What picture comes to mind when I ask you what a hero looks like? Do we think of men in capes who fly through the air? Do we think of men and women in uniforms with lots of medals? Do we think of ourselves as heroes? (I’d say that most of us do NOT think of ourselves as a hero). Well, guess what? Each person is a hero to someone…each of us impact a life – sometimes we have no idea how we impact someone’s day…we may not even know the person…it may be that we took time to chat with someone or that we held the door open for someone or that we smiled at someone. There are all kinds of ways to be a hero…it doesn’t always involve rescuing someone from a burning fire or pulling a car off of someone (although, those are very heroic deeds). If we wait around for the BIG heroic deeds where we will be recognized in the news, in the paper, or with a medal, we will miss out on countless opportunities throughout the day to be someone’s hero. There are many, many ways to be someone’s hero….what will you do? What choices will you make to be a hero?